Ex-Chelsea star Tony Cascarino still believes in Alvaro Morata and has informed him to shoot on sight to score more goals. Since arriving at Chelsea from La Liga giants Real Madrid for a club record fee of £60 million, Alvaro Morata has not hit the ground running. 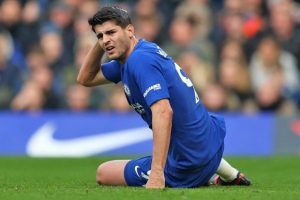 Morata’s back injury and lack of form have caused the Blues to drop support and faith in him despite scoring 13 goals and notching up six assists in his debut season in England. The Chelsea striker has endured a difficult first campaign with the West London club but Englishman Tony Cascarino still believes that Morata can become a great forward if he follows the basics. Probably the 25-year-old is lacking confidence and seeks some advice from Cascarino. Chelsea will be hoping that Morata takes up Cascarino’s advice against Manchester United in the FA Cup final which is, later on, this month. I guess what Cascarino is trying to say is that Alvaro Morata is just lacking confidence because of a few bad misses. The Spaniard has always shown what a great centre-forward he is with Juventus and Real Madrid so it’s just a matter of time before Morata starts scoring for Chelsea again. On a normal day, the former Real Madrid star would gobble up the chances that he has missed this campaign.